The fingers on Yusuf’s right hand are sore and black. “Some spray cans are more finger-friendly,” he says, and he should know. He finds a broken bottle on the ground, with the bottle cap still on the neck, and discovers it fits perfectly on his spray-finger. The ad hoc prosthetic will make the painting easier. Yusuf also finds an unfired rifle bullet on the ground. He tosses it to me. “A souvenir of Palestine,” he says. I thank him and put it into my pocket, but drop it back onto the ground when Yusuf is not looking. After all my time in the West Bank on this trip I will have enough trouble with airport security without having them find live ammunition in my luggage. Hey Ruby, let’s get married!! Yusuf is a graffiti writer for Send A Message. The project allows ‘senders’ from anywhere in the world to send a message to a recipient by having Yusuf and his cohorts spray paint it on the Wall. The sender pays thirty Euros for the service, and the recipient receives emailed photographs of the sprayed message. The money raised goes towards a Palestinian youth centre in Ramallah. The project is just over a year old, and already over 1200 messages have been sprayed onto the Wall, most by Yusuf. Many of the messages express a sort of long-distance solidarity with the Palestinian cause, but most of them don’t. According to Faris, a coordinator with the project, a full two-thirds of the messages they write are, what he calls, silly. There are birthday messages, wedding announcements, and everyday pronouncements of love. There are also simple ‘ads’ for personal websites, radio stations, or the websites of favorite rock bands. (Perhaps this blog could use some Wall exposure.) Someone had a falafel recipe sprayed on the Wall, and Faris told me that there have been at least a couple of marriage proposals in addition to Ruby. The project workers will not spray messages that are racist, insulting, or obscene. They will also refuse messages that they disagree with. For example, messages referring to the Wall as the ‘Security Barrier’ will not be written because the Faris and Yusuf – and all Palestinians, and myself – don’t believe that the Wall has much to do with security. And no overtly pro-Israel messages will be written. I told Faris that I’d seen ‘This wall saves lives’ painted on the Wall in Bethlehem and asked if he would accept this message. “No, because it is not true,” he said. Such messages are against the aim and spirit of the project, he told me. I was skeptical about the project when I first read about it. I’d spent three consecutive Fridays watching the stone-throwers and tear gas at the anti-Wall demonstrations in Jayyous where young men risked injury and arrest resisting the Wall. What was the point of writing something like ‘Happy Birthday Jane,’ on it? Faris told me that he is asked the same question by many Palestinians who also wonder what good the project ultimately does. 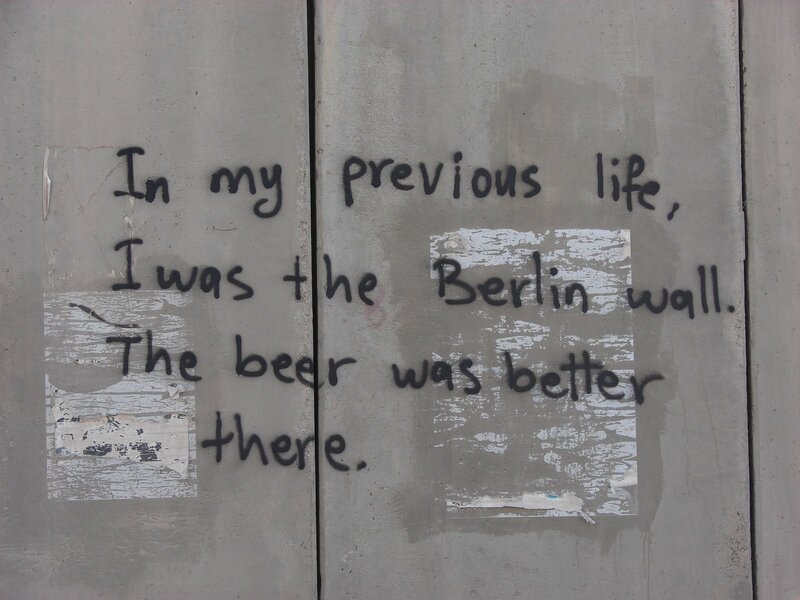 Faris said that ‘simple,’ Palestinians, those who the Wall affects the most, understand. The intelligentsia in Ramallah who have grown comfortable and have forgotten what it means to resist are the most cynical. Faris explains that in addition to raising money for the youth centre, the project serves as a unique form of dialogue. The sender and the receiver are linked by a concrete barrier built to separate. This irony, in itself, is compelling. The project also inspires more conversation about the Wall, and the system it represents, by exposing it to people who might not be politically motivated. In this way, the banal messages are most interesting. Those writing Mandela, Gandhi and Pink Floyd quotes are mostly preaching to the converted, or at least to the already interested. But someone who writes a message of love, or a falafel recipe, brings attention to the Wall through a sneaky sort of whimsy. I found the ‘silly’ messages on the Wall surprisingly compelling. I couldn’t help but think that they subverted the Wall’s martial nature. By using this military construction as a medium for decidedly lighthearted discourse, the ‘Security Wall’ becomes, in that moment, no more imposing than a bathroom wall. I didn’t see any “For a good time call…” messages, but I am sure they exist. 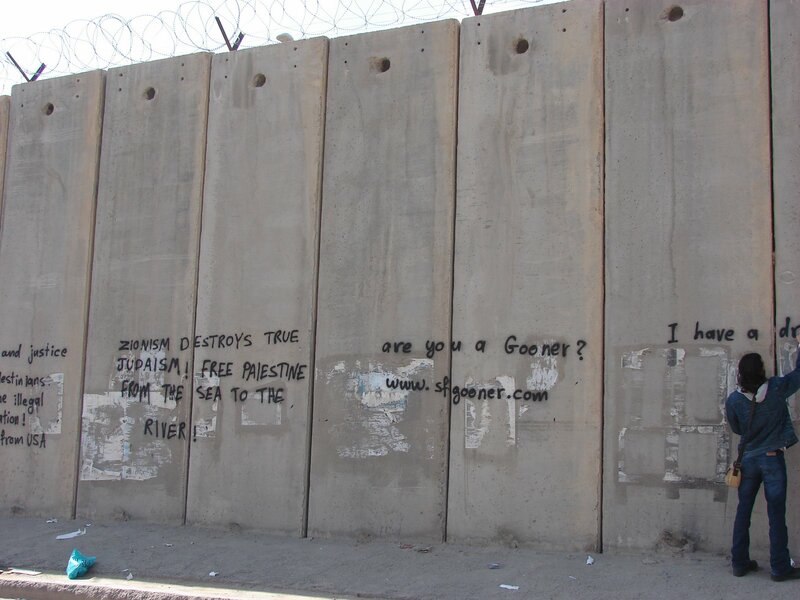 These messages do not impact the Wall’s real effects – passing through the cattle-worthy gates to the Israeli side was an instant reminder of this – and the project will not serve to bring the Wall down. But it was never meant to. 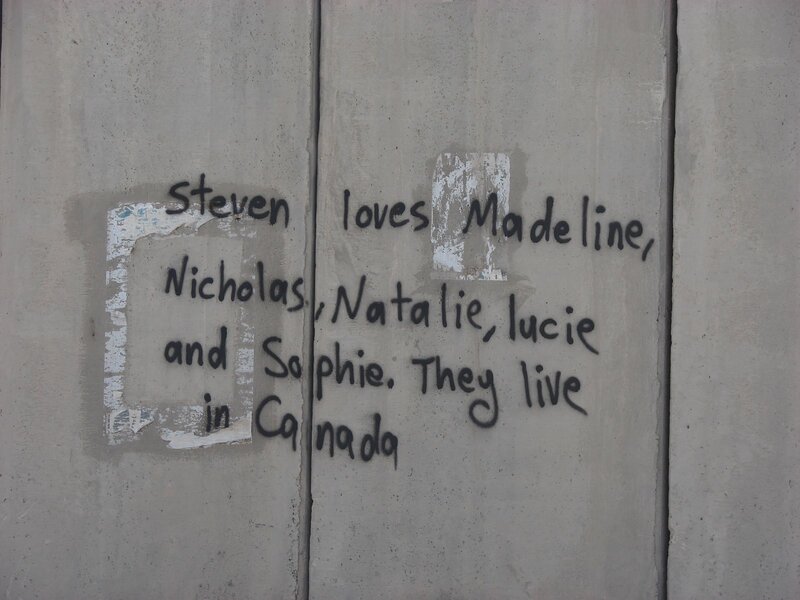 Instead, the messages mock the Wall and rob it of its emotional power.